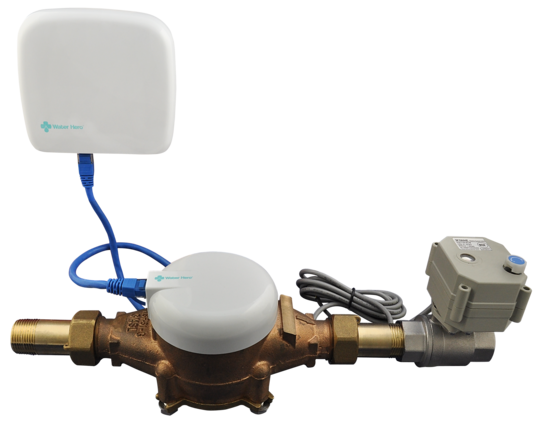 Water Hero is a leak detection system used to protect your property from costly & damaging water leaks like burst pipes, leaky toilets and more. Includes remote and automatic water shut off, detailed water usage information and user configurable text/e-mail alerts. Not interested in water shut-off or concerned about a plumber installation? 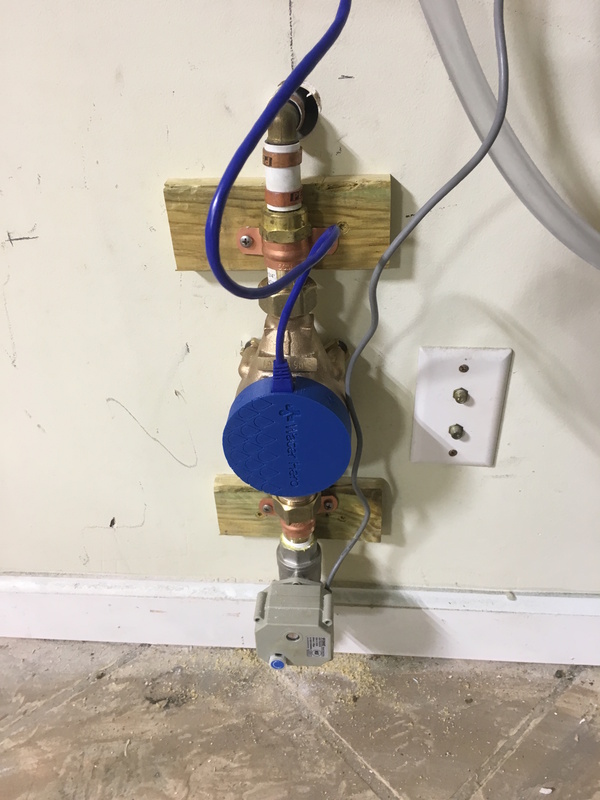 Water Hero is a leak detection system that comes with major components needed to plumb it into your home piping right where water enters your home. Six components include unions, ball valve, electronics and more. 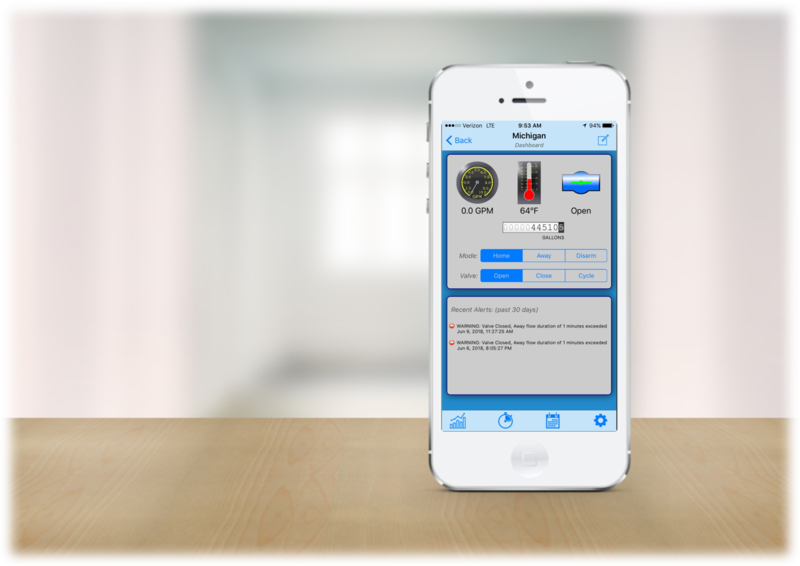 Water Hero is controlled and adjusted by our web and iOS app. There, you’ll see water usage history, valve position, home temp and more. 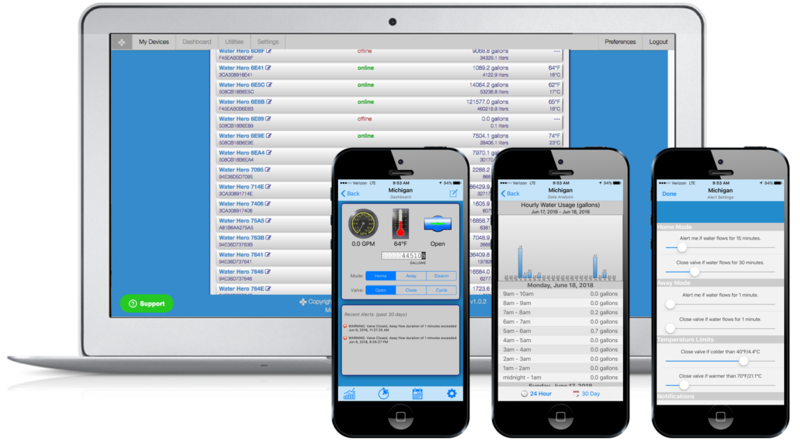 Water Hero is a completely user configurable leak detection system, so you’ll be able to change alerts, anywhere, anytime. 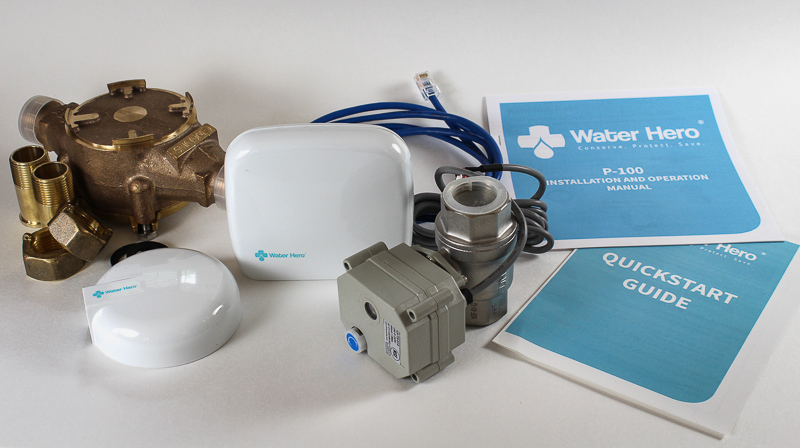 Includes Water Hero electronics, a meter and a motorized ball valve (an electronic water shut off valve). The P-100 is cut into the pipe where water mains enter the home/building. 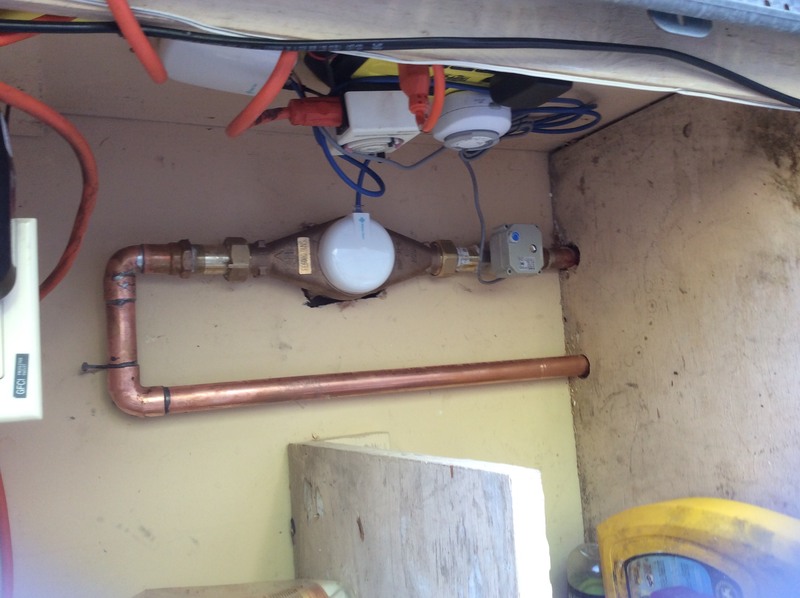 The unit requires power and WiFi to operate and is typically installed by a local plumber in under an hour. 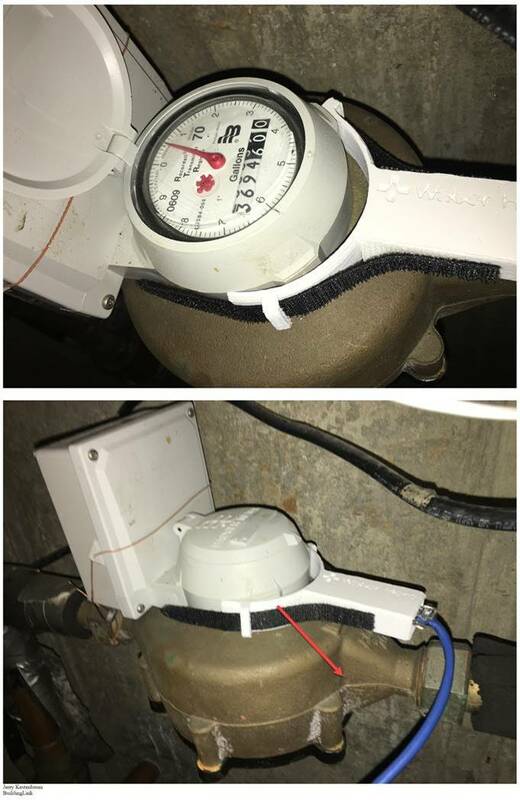 Includes Water Hero electronics strapped onto an existing, indoor water meter. After doing so, the unit is simply plugged in, connected to WiFi and calibrated. The K-100 model includes all back-end monitoring and text/e-mail alerts. Installation typically takes 15 mins. E-mail info@waterheroinc.com or call us at 877-662-4496 to see if your home is compatible. Your home is most vulnerable to water leaks when the power is out. It happens all the time – an ice storm or hurricane shuts down the power, sometimes for days. While the utility works feverishly to get power up, your WiFi is down, your power is off and your home is left vulnerable to a pipe burst or supply line leak. 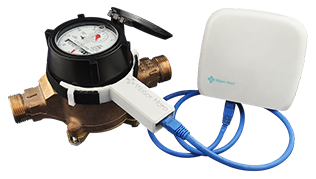 Water Hero sends text & e-mail leak alerts based on user configurable parameters such as continuous flow and temperature. 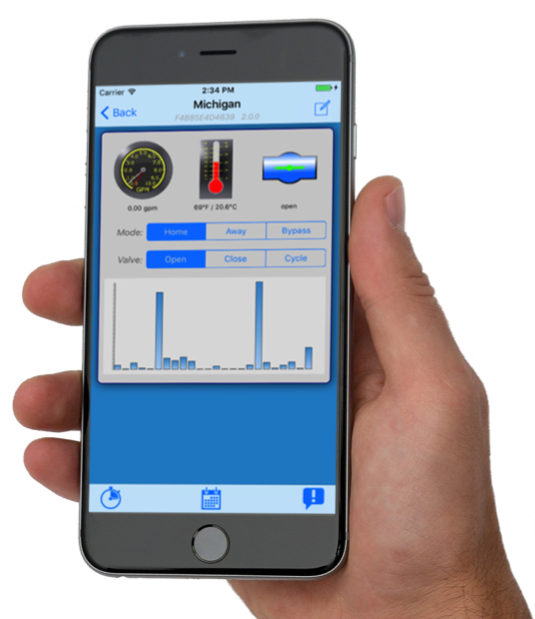 This minimizes false positives by allowing you, the owner, to adjust settings as needed and offers you the most advanced water leak protection that fits your needs. Here is how it works. Water lines entering homes/buildings can be sizes. Typically, homes have water main sizes between 3/4″ and 1 1/4″. Water enters a building differently depending on the region and Water Hero may be installed indoors or outdoors. We’re confident that you’ll love Water Hero because of the feedback we’ve received from hundreds of customers. If though, for any reason, you don’t, send it back within 60 days of purchase and we’ll provide a full refund including all shipping costs. Give us a try – we stand behind our products. Recently a toilet valve broke while I was sleeping and the Water Hero detected the problem and shut off the water before any significant damage was caused. The Water Hero provides me with peace of mind and I recommend it to all! The product very easy to set up and has performed perfectly from the first. Overall, very pleased with the product. I started to look online to see what might be commercially available. I found three products that roughly fitted the requirements, but the Water Hero P-100 was EXACTLY what I was looking for, and considerably less expensive than the other two. 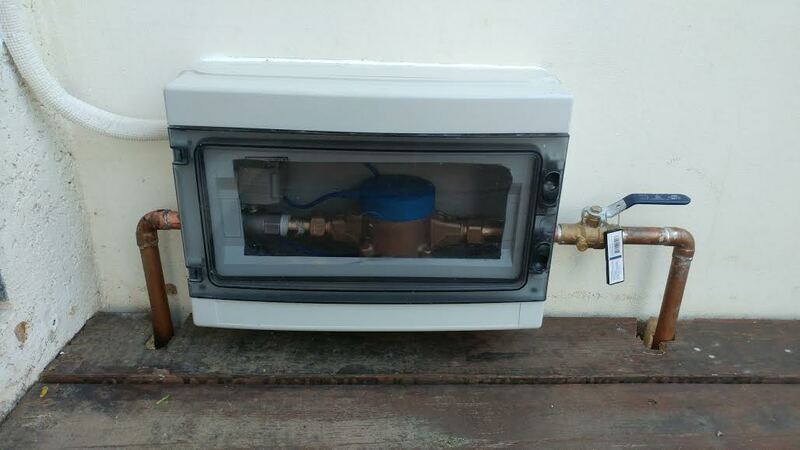 I ordered the product, installed the electronics myself and hired a plumber to install the water sensor and ball valve. The product very easy to set up and has performed perfectly from the first. 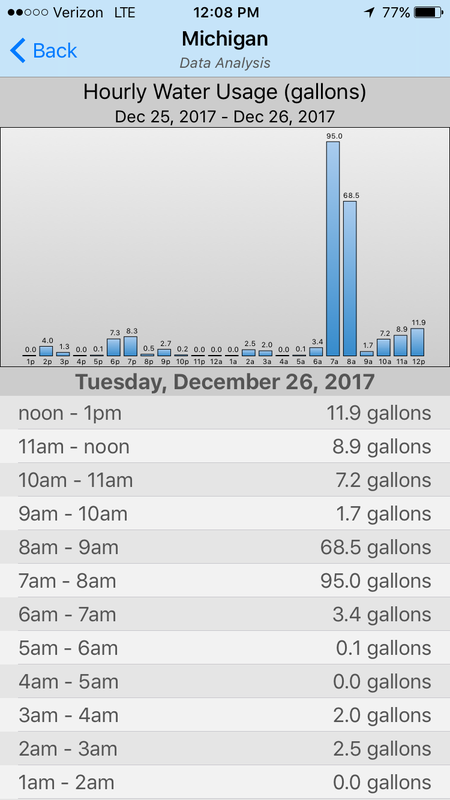 Given we are residents of California, where we have had severe drought for the past few years, the realtime water usage meter is a bonus, as it allows us to see exactly how much water is being used, and by which devices/appliances. “My house has had three floods over the past decade. All of the floods occurred when I was away from home, leaving me with thousands of dollars in damage. I bought the Water Hero detection system after reading about it online. It has exceeded all of my expectations! 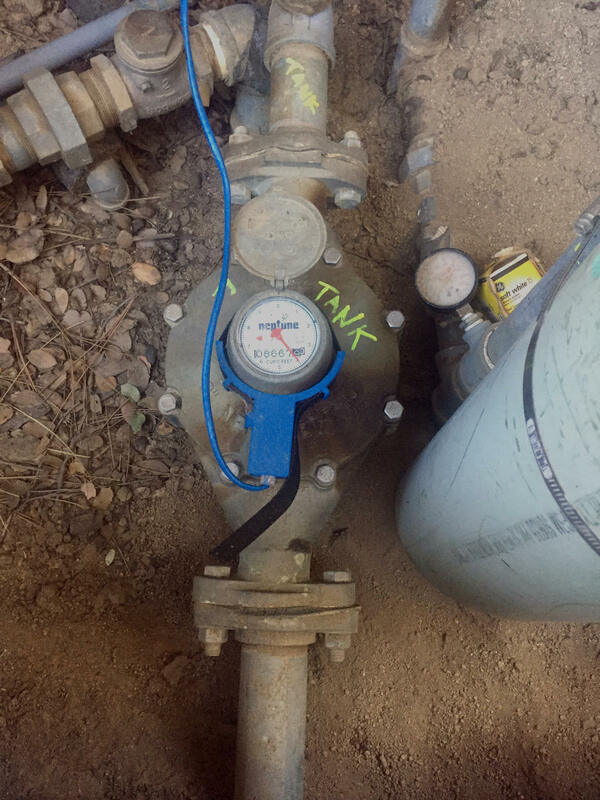 “Having the peace of mind of knowing I will be notified in the event of unplanned water use is a great relief. We travel quite a bit and my parents are snow birds, so they are often away for months at a time. 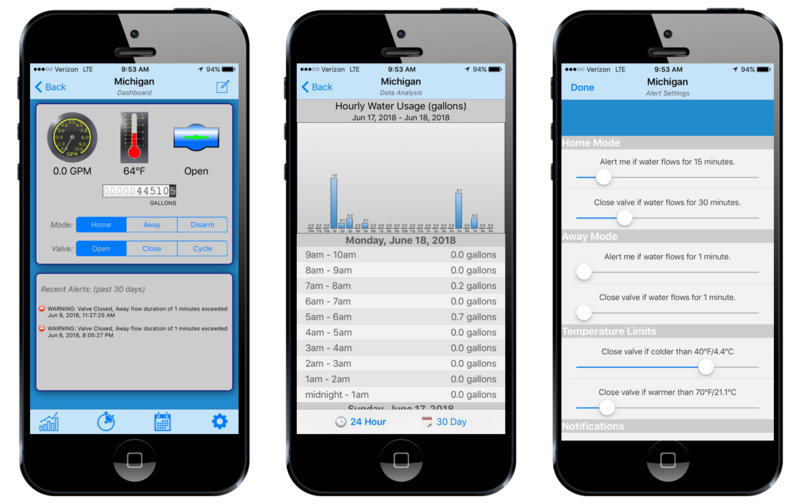 Knowing the Water-Hero is monitoring water use at the source ensures we’ll know very quickly when water is running, or when it goes over our thresholds. The other item we have come to rely on is the temperature value. We live in a very cold winter climate, and no one wants to come home to a furnace problem or a water problem. 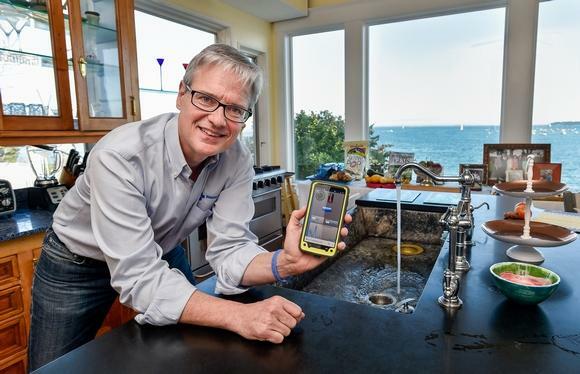 By being able to check the temperature in the furnace room (where our water meters are) via the Water-Hero dashboard from anywhere allows the peace of mind of knowing the furnace is running when no one is home. I didn’t expect to change my water usage as a result of getting this device. After monitoring the water usage I could see on the dashboard just how much water I was using. Getting the detailed hourly breakdown showed we had a toilet that was leaking. By using the realtime indicator and turning off toilets one by one were able to find the leaking toilet and fix the issue. We also have set the email reminder to help us identify when we are using water for long periods of time. Identify underground leaks that were not otherwise detectable. One had been active for 8 years. Try it. The Peace of Mind Is Worth The Small Investment.